Salt Lake City is a center of growth and opportunity for Data Centers. 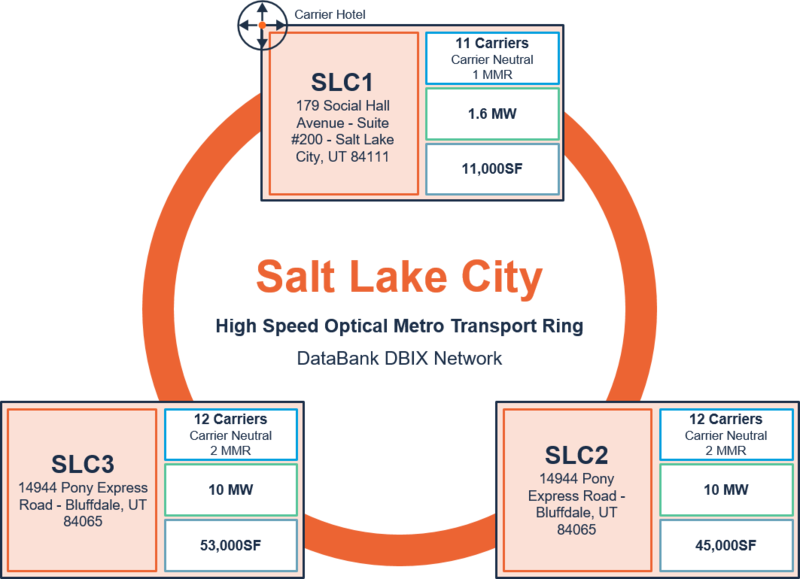 DataBank is a leader in the market with three strategically located data centers – Our Downtown SLC1 Carrier Hotel and the Bluffdale campus with SLC2 and SLC3. Not only does Utah’s high elevation and dry desert geography allow us to efficiently cool our data centers, the state also touts some of the lowest occurrences of natural and man-made disasters in the United States. Forbes has called Utah the “Best State for Business” and “Least Debt Burdened”. The Pew Charitable Trust says Utah is the “Best State Managed Government”. With it’s prime location easily accessible to both West Coast and growing Mountain communities, DataBank’s range of high performance data centers and solutions help our customers meet and exceed their business objectives. DataBank’s Downtown Salt Lake City data center is a multi-tenant colocation facility located in the heart of the downtown business district. The site is the primary carrier-hotel for the Salt Lake City area and is highly populated with a number of prominent Tier-1 and Tier-2 network providers. Our Granite Point East data center is strategically located in Bluffdale, UT, minutes from downtown Salt Lake City. With a carrier-neutral design and 50,000+SF of raised-floor space for customer equipment, the facility offers network connectivity to multiple Tier 1 and Tier 2 providers. DataBank’s Granite Point West data center is strategically located in Bluffdale, UT, minutes from downtown Salt Lake City. With a carrier-neutral design, the 95,000SF building has over 55,000SF of raised-floor space for customer equipment and offers network connectivity to multiple Tier 1 and Tier 2 providers. Our National IP Transport Service provides inter-region and intra-metro region connectivity. This service delivers a resilient communication method for connecting environments within multiple DataBank sites.